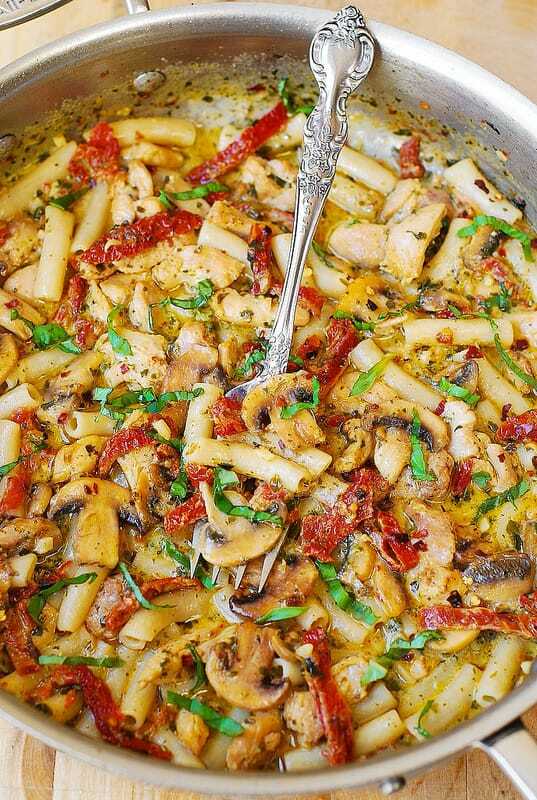 Chicken Pesto Pasta with Mushrooms is pure comfort food and an easy-to-make family friendly dinner! Perfect any time of the year but especially during the Summer, when fresh basil abounds. 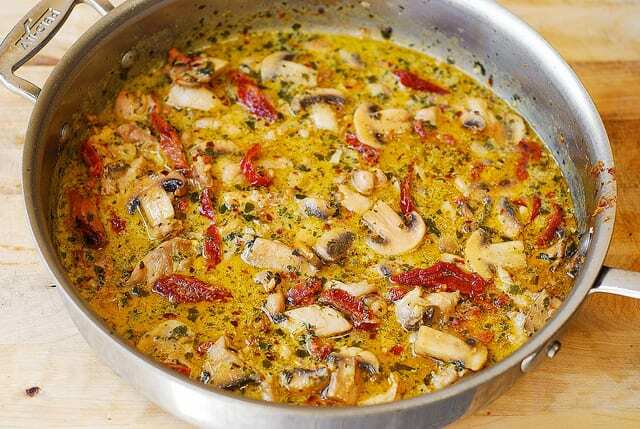 The delicious creamy pesto sauce is made with milk, basil pesto, red pepper flakes. I love pesto, and cook a lot with it in the Summer. I’ve been making this chicken pesto pasta for years, and only now finally posting the recipe on my blog. 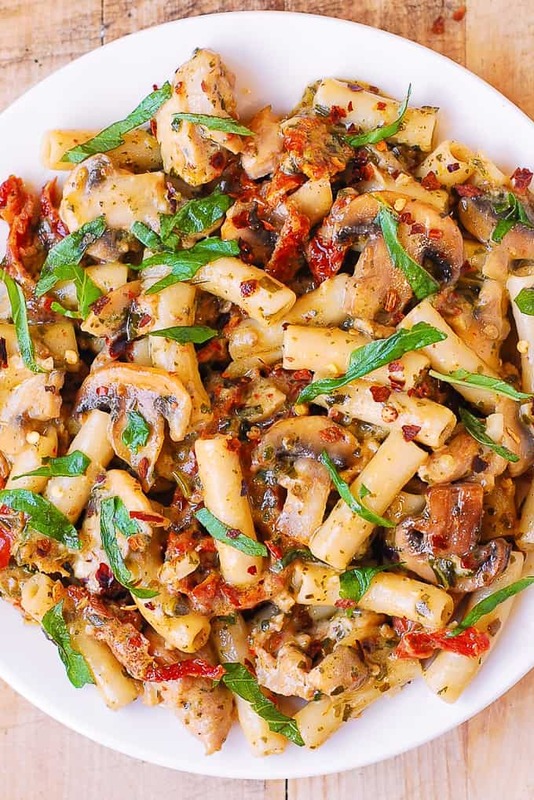 It combines some of my most favorite flavors: basil pesto, sun-dried tomatoes, mushrooms, fresh basil, red pepper flakes. And, the whole recipe takes only 30 minutes from start to finish. Perfect amount of time since you want to spend most of the time in the Summer outdoors and not cooking, right? I use penne because pesto sauce covers more surface with short pasta like penne. Long strands of spaghetti pasta are also perfectly suited for a creamy and oily sauce like basil pesto sauce. Angel hair pasta is an excellent choice for this sauce, as thin noodles will be perfectly smothered with this creamy pasta sauce. This beautifully green basil pesto is everything that a pesto should be: pine nuts, parmesan cheese, garlic, olive oil, and lemon juice. Another classic recipe is this fresh basil pesto. And this recipe for homemade pesto is amazing! Store freshly-made pesto in an air-tight container in the refrigerator for 1 week. Add a thin layer of olive oil on top of the surface of basil pesto – this will help prevent the pesto from turning brown. You can freeze fresh basil pesto for up to 3 months. It freezes really well. Can you freeze basil pesto? For long term storage, use ice cube trays. Fill clean ice cube tray with basil pesto. Allow the basil pesto to freeze. Release basil pesto “ice cubes” from the ice cube tray. Add basil pesto “ice cubes” into small baggies and keep them frozen for up to 3 months. This way, when it’s time to use pesto in a recipe, you don’t have to thaw a whole container of basil pesto. Just take an ice cube or two and use them for your recipe. Allow frozen pesto to sit at room temperature for about an hour or until it’s completely thawed. Place frozen basil pesto in the refrigerator in an air-tight container overnight so that it gets defrosted. If you use basil pesto in the sauce, like in this recipe, you can just add basil pesto “ice cube” directly to the sauce and stir on medium heat, allowing the heat to defrost the pesto. I use skinless and boneless chicken thighs in this recipe and highly recommend you do too! They are so flavorful, moist, easy to chop and perfect for this kind of recipe. Below are some step-by-step photos and instructions demonstrating the key steps for how to make this delicious pasta dish. First, heat olive oil in a large skillet on medium heat. 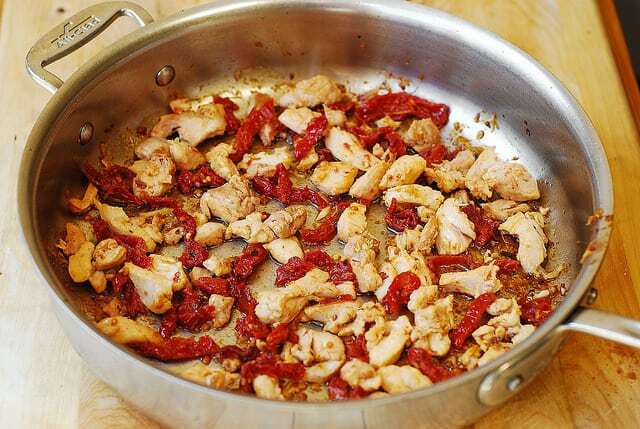 Add chicken (chopped up) with sun-dried tomatoes (chopped into smaller bites) to the skillet, sprinkle with red pepper flakes. Saute for about 1 minute on medium heat. Then, add garlic, pesto, milk, and 1/4 teaspoon of salt. Bring to boil, immediately reduce to simmer and simmer, stirring until everything is well combined. Remove from heat. Taste, and add more salt, if needed. Finally, cook pasta according to package instructions. Drain. 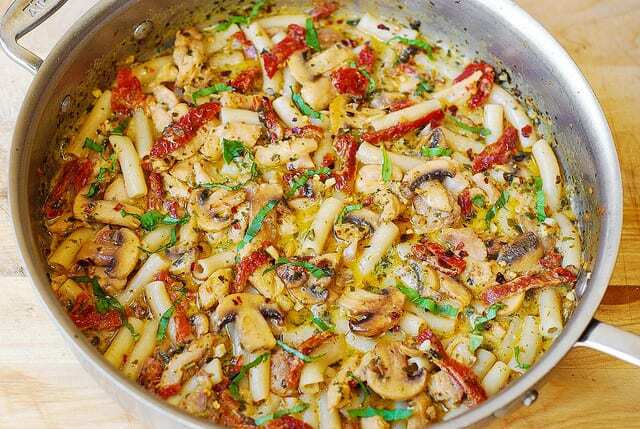 Add cooked pasta to the sauce, reheat. 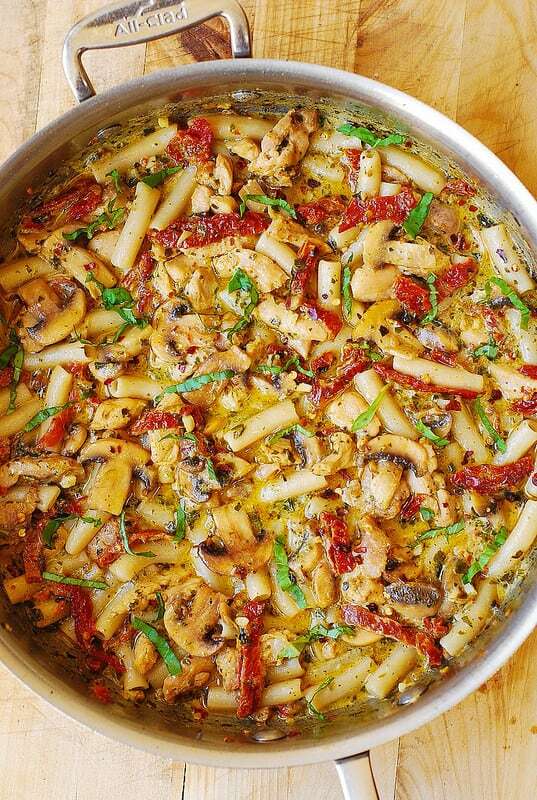 Top with chopped fresh basil. 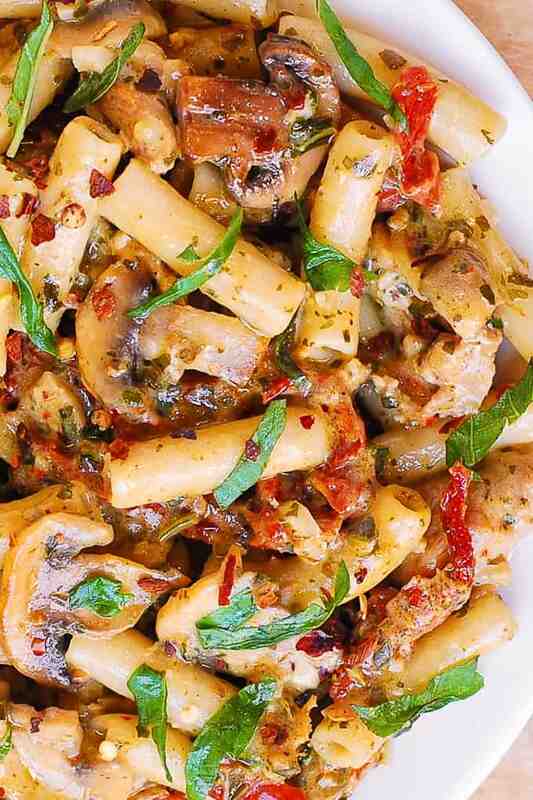 This chicken pesto pasta recipe combines some of my most favorite flavors: basil pesto, sun-dried tomatoes, mushrooms, fresh basil, red pepper flakes. Heat olive oil in a large skillet on medium heat. 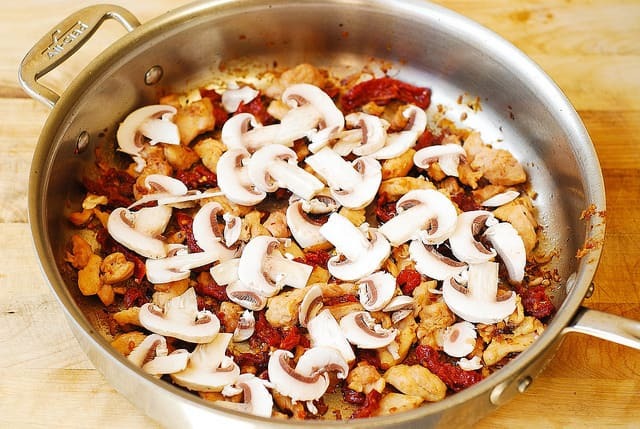 Add chicken (chopped up) with sun-dried tomatoes (chopped into smaller bites) to the skillet, sprinkle with red pepper flakes. Saute for about 1 minute on medium heat. 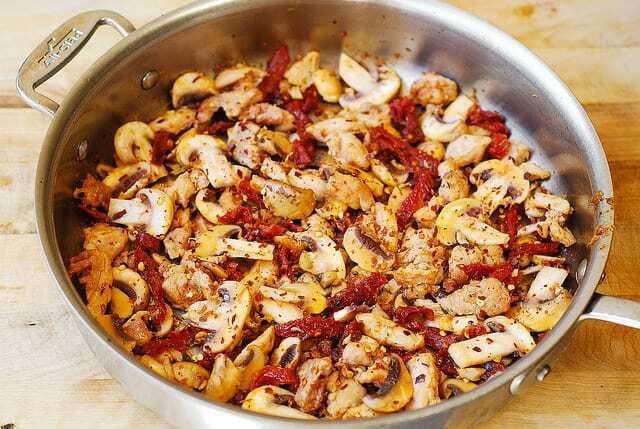 Add sliced mushrooms (add another 1 tablespoon olive oil if needed) and saute for about 2 more minutes (or a little bit more), until chicken is cooked through and mushrooms are softened. Add garlic, basil pesto, milk, and 1/4 teaspoon of salt. Bring to boil, immediately reduce to simmer and simmer, stirring until everything is well combined. Remove from heat. Taste, and add more salt, if needed. Cook pasta according to package instructions. Drain. Add cooked pasta to the sauce, reheat. This recipe was originally published on June 14, 2016 and republished with updates, cooking tips in May 2018. Do you think adding carmalized onions to this would be good? OMG this was the most awesome pasta dish. I used cream instead of milk because I had some that needed using and added some broccoli that needed using to but otherwise followed the recipe exactly. This is going to become a regular on our menu list!! Megan, I am so happy you liked this recipe! Great idea to add some broccoli! Made this last night. Delicious! What a great and simple recipe. The kids loved it. I added asparagus. So glad you enjoyed this pasta! Adding asparagus sounds so good! 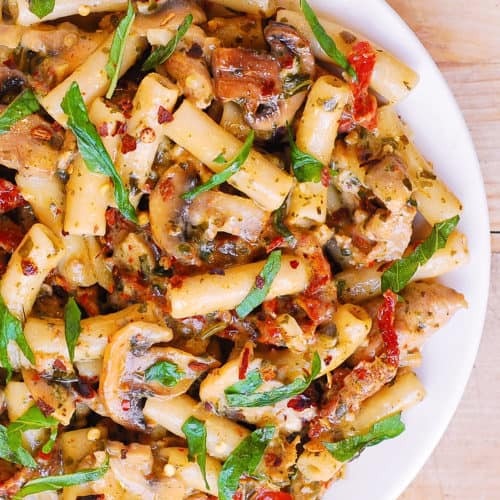 I would like to make this but only have the sun-dried tomatoes that come in a package, how can use these in this recipe or do I need the ones in oil. You can use sun-dried tomatoes that come in a package (without olive oil). You’ll be cooking them in the olive oil anyway. This has become one of my favorite recipes! It tastes wonderful, is easy, and is great for lunches. Thanks for posting. This has become a staple in our house. Our family loves it. I make a lot for leftovers for lunches. Thank You for the recipe!